Airtel Network just introduced a new free data bundle plan and it is called the "Airtel YouTube Flex Data plan". The free bundle data can be used to stream or watch YouTube videos online without having to download. The data is configured to be used for YouTube video streaming. Although, these newly introduced Airtel YouTube Flex data plans are capped with price, but I consider it free just because the price is such that is affordable by all. And talking about the data attached to the prices stipulated for subscribers, it doesn’t reach the price at all in a normal sense, so that’s why I tagged it to be free. Is just like, Airtel decided to dash out the data(s) free because the prices doesn’t worth the data(s). You will get to understand what am talking about when you see the data plans below. This Airtel YouTube Flex data plans are categorized based on Monthly and weekly basis. 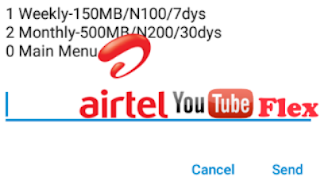 The monthly YouTube Flex plan, when subscribed to by any customer gives a 500mb worth of data for a cheap price of N200 while the weekly, when subscribed to, gives you 150MB for just N100. See Also: Short USSD Codes To Migrate To The Top Best Cheap Data And Unlimited Call Tariff Plans On MTN, Airtel, Etisalat And Glo Networks. >> Then dial this short USSD code *141*4#. >> From the pop-up that will display, choose the number “1” option if you are going for the weekly plan that goes for N100 for 150MB. >> And also, if you wish to activate the Monthly plan, then select "2" and you will be subscribed to the 500MB plan that goes for N200. 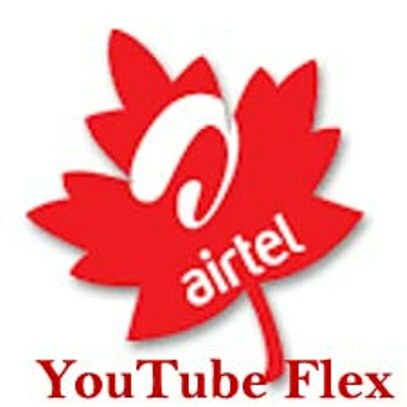 The Airtel YouTube Flex Data plan works on all PC and Mobile phones with enabled internet access, whether with 2G, 3G, or 4G connection signals and can be shared with free WiFi connections. Although, the data bundles are meant for YouTube videos alone, it can still be used to surf the internet for free. So in case, you want to flex the data plan on all your browsers and social media messaging chat apps (like; whatsapp, facebook, twitter, telegram, skype, snapchats, instagram, imo etc) with the latest free browsing cheat VPN apps like Tweakware, Sypon Shield, Psiphon Handler, Psiphon A+ Pro, QueenCee and Downloadable 2017 Netify VPN APK App For Free Browsing, then comment by requesting for the APN settings/configurations and I will reply you with the settings.